NASA Equipment Visible on Moon - Solar System Planets And Moons Section. 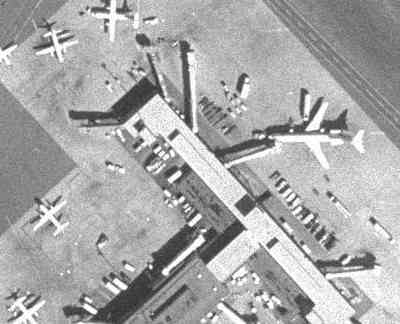 An example of half-meter resolution overhead photography. Image credit: MIT. Houston: "We've got you on television now. We have a good picture." Gene Cernan, Apollo 17 commander: "Glad to see old Rover's still working." "Rover," the Moon buggy, sat outside with no one in the driver's seat, its side-mounted TV camera fixed on Challenger. Back in Houston and around the world, millions watched. The date was Dec. 19, 1972, and history was about to be made. Those were the last men on the Moon. After they were gone, the camera panned back and forth. There was no one there, nothing, only the rover, the lander and some equipment scattered around the dusty floor of the Taurus-Littrow valley. Eventually, Rover's battery died and the TV transmissions stopped. And why haven't we photographed them? There are six landing sites scattered across the Moon. They always face Earth, always in plain view. Surely the Hubble Space Telescope could photograph the rovers and other things astronauts left behind. Right? Better pictures are coming. In 2008 NASA's Lunar Reconnaissance Orbiter will carry a powerful modern camera into low orbit over the Moon's surface. Its primary mission is not to photograph old Apollo landing sites, but it will photograph them, many times, providing the first recognizable images of Apollo relics since 1972. The spacecraft's high-resolution camera, called "LROC," short for Lunar Reconnaissance Orbiter Camera, has a resolution of about half a meter. That means that a half-meter square on the Moon's surface would fill a single pixel in its digital images. "I would say the rovers will look angular and distinct," says Mark Robinson, research associate professor at Northwestern University in Evanston, Illinois, and Principal Investigator for LROC. "We might see some shading differences on top from seats, depending on the Sun angle. Even the rovers' tracks might be detectable in some instances." Even more recognizable will be the discarded lander platforms. Their main bodies are 4 meters on a side, and so will fill an 8 by 8 pixel square in the LROC images. The four legs jutting out from the platforms' four corners span a diameter of 9 meters. So, from landing pad to landing pad, the landers will occupy about 18 pixels in LROC images, more than enough to trace their distinctive shapes. Shadows help, too. Long black shadows cast across gray lunar terrain will reveal the shape of what cast them: the rovers and landers. "During the course of its year-long mission, LROC will image each landing site several times with the sunlight at different angles each time," says Robinson. Comparing the different shadows produced would allow for a more accurate analysis of the shape of the objects. Enough nostalgia. LROC's main mission is about the future. According to NASA's Vision for Space Exploration, astronauts are returning to the Moon no later than 2020. Lunar Reconnaissance Orbiter is a scout. It will sample the Moon's radiation environment, search for patches of frozen water, make laser maps of lunar terrain and, using LROC, photograph the Moon's entire surface. By the time astronauts return, they'll know the best places to land and much of what awaits them. Two high-priority targets for LROC are the Moon's poles. "We're particularly interested in the poles as a potential location for a Moon base," Robinson explains. "There are some cratered regions near the poles that are in shadow year-round. These places might be cold enough to harbor permanent deposits of water ice. And nearby are high regions that are sunlit all year. With constant sunlight for warmth and solar power, and a potential source of water nearby, these high regions would make an ideal location for a base." Data from LROC will help pinpoint the best ridge or plateau for setting up a lunar home. Once a moonbase is established, what's the danger of it being hit by a big meteorite? LROC will help answer that question. "We can compare LROC images of the Apollo landing sites with Apollo-era photos," says Robinson. The presence or absence of fresh craters will tell researchers something about the frequency of meteor strikes.